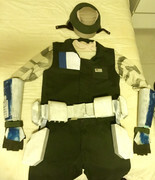 2) What would be the correct detachment for this costume? COR? RAID?? Rebel Commanders??? This is the version from the final season of Rebels, correct? As far as character name, I believe he is Commander Rex by the end of the series. Regardless, he has a home in GSC for sure. I'll check-in with the other DCOs for their thoughts as well. That’s correct, it’s from the final season of Rebels. I’m not sure if he was Commander Rex at that stage or whether that happens later. Thanks for looking into this.